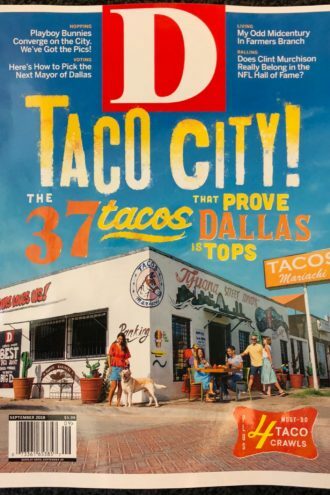 Yesterday, Tim Rogers tweeted a photo of our September cover, which includes the words “Taco City” and the phrase “the 37 tacos that prove Dallas is tops.” I think I absent-mindedly retweeted it from the D account. And then our mentions started stacking and my Firefox froze. There were plenty of bad jokes, (Torchy’s came from Austin, my guy) but the highlight was the “LOL” from the mayor of San Antonio, Ron Nirenberg. We have yet to hear a Necessary and Incredibly Important Response from Mayor Mike Rawlings, who it appears was probably eating tacos just last night at one of the restaurants we mentioned in the feature. First of all, to lifestyle writers and TV producers and editors in need of #content on a summer weekday: you are welcome. Roundup time! The San Antonio Current, which apparently “can’t even,” took umbrage at the idea that we’d try to do something more creative and engaging than just telling readers where to get the best tacos. We take reader service seriously, San Antonio Current. That is why we commissioned José Ralat, the food editor at Cowboys & Indians magazine and the author of the forthcoming book American Tacos: A History and Guide to the Taco Trail North of the Border. The Hearst-owned San Antonio Express News got the same blurb published in the corporation’s Houston and Laredo papers, which basically says San Antonio has the best. Seems weird for readers in Houston and Laredo, but whatever. Is anything local anymore once it reaches Google? Charlie Scudder at the News waded in, too, dredging up an old comment that José gave the paper in 2016 about how Dallas has one of the most diverse taco scenes in the state: “You can’t say that about Austin.” BOOM. The issue is on newsstands tomorrow, so you can judge for yourselves. And if you’re in Dallas, come to our taco event next week. You’ll get to try what we’re putting our reputation on. And there’s an open bar.